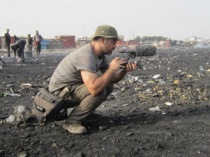 His films have covered such diverse topics as sub-Saharan African migration in Morocco, electronic waste in Ghana and illegal logging in Papua New Guinea, and have been screened and broadcast widely, winning numerous awards around the world. All of his films are available to watch online for free HERE. David’s latest film REVENIR (2018, 84mins) is a collaboration with Kumut Imesh, a refugee from the Ivory Coast in West Africa, who now lives in France. This film follows Kumut as he returns to the African continent to attempt to retrace and film the same journey that he himself took more than ten years ago, when forced to flee his country to seek asylum …. But this time with a camera in his hand. The independent production of REVENIR was funded via a successful crowdfunding campaign, thanks to the support of 242 people from 35 countries around the world, under the working title Clandestine Crossing. David’s previous film THE LAND BETWEEN (2014, 78mins) follows sub-Saharan African migrants living in the mountains of northern Morocco, dreaming of entering Europe for a better life. The film premiered and was awarded “Best Feature-length Documentary” at the FIFE International Environmental Film Festival in Paris, and has since been broadcast and screened widely around the world, winning many awards including Naples Human Rights Film Festival (Best Film), Festival of Migrant Film (Best Film) and Lampedusa Infestival (Best Film). It was also screened at the European Parliament in Brussels, Belgium in 2015. – WINNER “Best Editing” – Social Impact Media Awards (SIMA) 2013 – U.S.A.
– FINALIST “Best Short Documentary” – Social Impact Media Awards (SIMA) 2013 – U.S.A.
– FINALIST “Best Documentary Short” – Social Impact Media Awards (SIMA) 2013 – U.S.A.